I’m writing this post from my iPad so I have no idea what it’s going to look like when I’m done. Just wanted to share a new set of photos that I worked on this evening. I went back into the archives to some shots that I took on our cruise to Baja Mexico last April. For some reason I had never really been that enthusiastic about the photos from that trip. They were mostly of the snapshot variety, and since the skies were overcast most of the time we were out there, the lighting wasn’t that great for photography. Tonight I decided to see what Topaz Adjust could do with a few of the images, and I’m glad I did. You can see the entire set at my Flickr page. I hope you’ll check them out and let me know what you think! This is a rose that we saw at the L.A. Cetto winery where we toured while docked in Ensenada Mexico. The roses are planted at the ends of the rows of grapevines, and they serve as an early warning system to alert the growers to pests and diseases that could affect the vineyards. 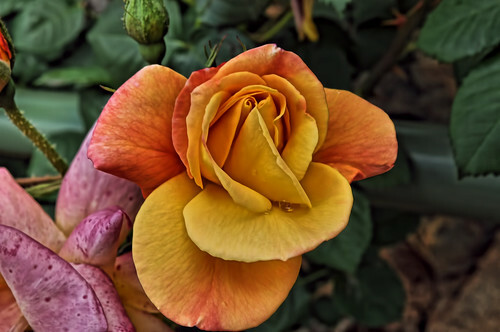 Their roses were just beautiful, and this shot sprang to life when I ran it through Topaz tonight. This entry was posted in Processing and tagged Baja, camera, cruise, D5000, Mexico, Nikon, photography, Rose, Topaz. Bookmark the permalink.